Completely custom 3 piece wheels. Kyohei Hara in Japan, approached us at WCI for a set of custom 3 piece wheels. WCI built the custom 3 piece wheels to Kyohei’s exact specifications and to clear his Brembo big brake kit. 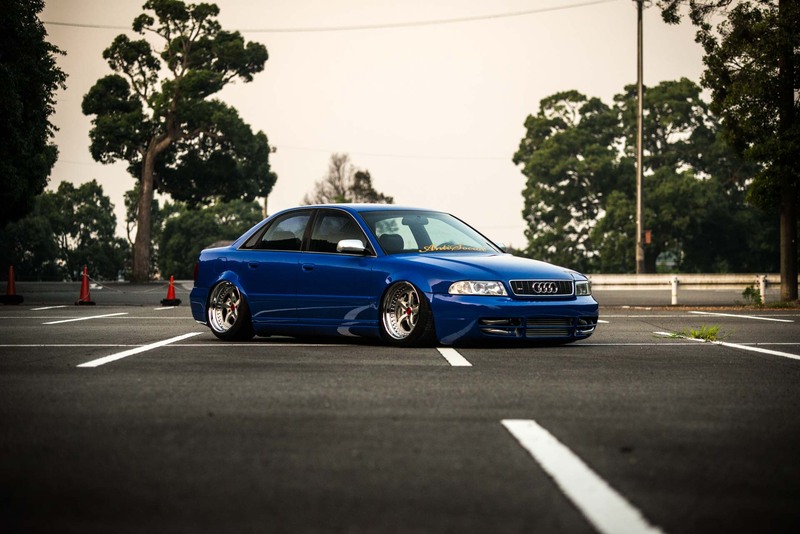 The Nogaro blue on the B5 S4 is rare. The custom 3 piece CC1’s clear the Brembo brakes by a few mm’s. WCI prides itself in building custom wheels to barely clear peoples brakes. This in turn, gets the customer the maximum possible lip size. Besides lip size, why does this matter? Because you don’t have to run those terrible and sketchy spacers! Everyone has been there and done that. I don’t care what anyone says, spacers never ride good. Ditch the spacers and vibrations and upgrade to a set of completely custom wheels that are built to your exact likings. This means for whatever width and width you choose, you will get the largest possible lip size. Kyohei did some body work and pulled and rolled his fenders. The WCI CC1’s were made to 18×10 for the front and 18×11 for the rear. The wheels are done in a brushed with clear center, brushed red center caps and polished lips.